Alien Robots is a slot machine made by the Swedish game provider Net Entertainment. It's all about the robots on this slot, and all the premium symbols are different robot characters. 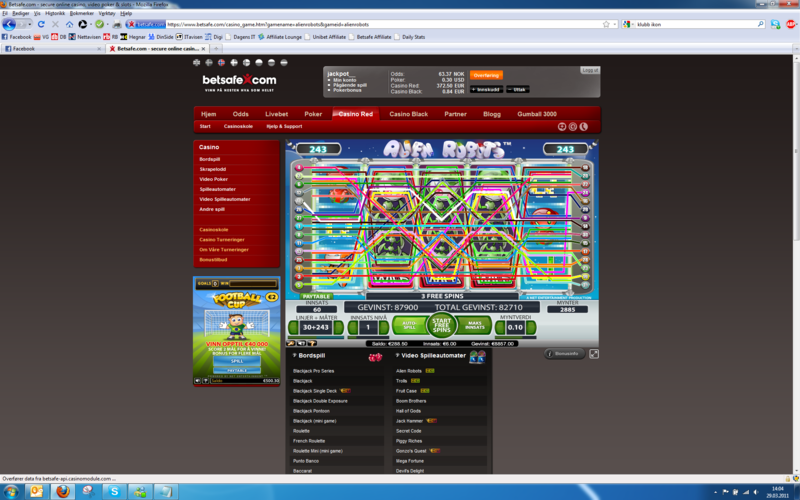 The first thing you might see on Alien Robots is that you play on both 30 paylines and 243 ways at the same time. This is a highly rare combination, and it means that you win with any three of a kind combination from left to right, but also that you get a higher prize in addition if the symbols line up on one of the 30 paylines. Alien Robots maximal win is listed to be 50.000 credits, but this is completely wrong, as that would equal to a 166x win. I've personally won a 1.465x win from a spin during the free spins, and then I was failing to line up the best symbol on the 5th reel. So from what I can read of the paytable this slot has a potential maximal win of about 2.800x the total stake per spin during the free spin feature. The RTP is set to 96.60%. First of all, I’ll take a short moment to explain how the unusual line combination of 30+243 works. When you play on Alien Robots, you have 30 basic paylines that will give you one type of pay, but in addition your also paid out a prize for the 243 ways combination. Payline wins are in general higher than the 243 ways wins, as they are way harder to get. Alien Robots has single wild symbols on reel 2, 3 and 4, but they will upgrade to become both expanding and sticky during the free spin feature. The wilds substitute for all other symbols, except the scatters. The free spin feature on this slot machine has a really nice potential, and if you're lucky, the three middle reels will be filled with expanded wild symbols. This is definitely an exciting feature! Free spins: The free spin feature is triggered by getting 3 or more scatter symbols. The amount of free spins is determined by the amount of triggering symbols. 3 scatters = 10 free spins, 4 scatters = 20 free spins and 5 scatters = 50 free spins. During the free spins, the normal wild symbols becomes expanding wilds. For each time you have a spin where one or more wild symbols expand, you're also awarded with a re-spin where the wild symbols stick to the reel while it's still expanded. If additional wilds appear during the re-spin, another re-spin is given, but then only with the new wild symbol as a sticky symbol. So to be able to fill reel 2, 3 and 4 with wilds, you would need to get all of them during one spin. It's possible to re-trigger more spins during the feature. Alien Robots is created by Net Entertainment.